Hoover Inc. recalled about 142,000 Hoover WindTunnel Canister Vacuums after 69 reports of them overheating or shorting, even when turned off, said the U.S. Consumer Product Safety Commission. So far one consumer suffered a blister and incidents include a fire and two reports of carpet damage, the CPSC said. The power cord between the power nozzle and the vacuum's wand connector can short-circuit and possibly catch fire or give off an electric shock to consumers. The short can still happen if the vacuum is turned off but still plugged in.Consumers should stop using the Chinese-made vacuums and call Hoover for a free repair. Hoover recalled more than 100,000 upright WindTunnel vacuums last year after reports of fires. 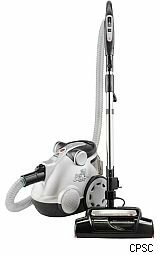 Included in the Hoover recall is the Hoover WindTunnel Bagless Canister Vacuum model S3755. The vacuum is silver and black and has a power nozzle. The model number is on the label on the canister's bottom. These vacuums were sold at retailers nationwide and online from March 2003 to May 2008 for between $250 and $280. Hoover said consumers can figure out if they have the recalled vacuums by looking at the serial numbers. The first four digits are the month and year. Hoover lists all the affected serial numbers. This Hoover vacuum model is still sold in stores including Walmart and online at Amazon.com, so make sure to check the serial number to see if your vacuum is part of the recall. If it is, contact Hoover at (888) 564-2066 weekdays between 8 a.m. and 7 p.m. Eastern Time. The company will send you a prepaid carton to ship the nozzle and hose to its repair center for a fix and it will be returned to you.